JetBrains folks: Java 6 reached end of life two years ago. Java 7 will reach public EOL in a couple months and you still haven't figured out how to use it? That can only mean you're not putting resources into IntelliJ. In other words, letting it drift into maintenance mode, collecting money from people willing to go along with that but never really bringing it up to date. It is legacy now. I'm truly sorry to hear that, but it means I can't install it, can't buy it, and have to recommend to others that they avoid it (hardly necessary, they'll be blocked by the Java 6 requirement, too). Larry West, our products bundled with custom JDK 1.8 are already available via EAP. Custom JDK 1.8 will be available with the release versions soon, we are doing the final tests and fixing the remaining bugs. You can see from the main article that most of the issues have been already resolved. @Serge okay, I eagerly look forward to that release! 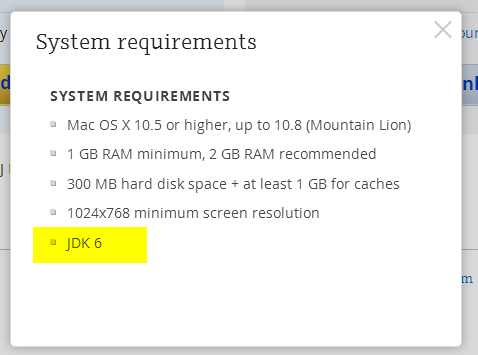 You can install Java 6, then re-install Java 8 JDK, and the default Java on your system will be Java 8. Java 6 will only be used by those applications like IntelliJ that actually go looking for it. The Java 6 will not be Internet-facing, except when it calls IntelliJ to check for updates. Then you can remove Java 6 JetBrains releases the version with the fixes. All take you to a broken link :( Very frustrating. Weird, the link still works for me. Try the direct dmg link instead: http://support.apple.com/downloads/DL1572/en_US/JavaForOSX2014-001.dmg . Duckumu, Welsh, I've sent you the alternative link via support tickets. If anyone else can't download JDK 1.6 from Apple site, please submit a ticket to JetBrains support for the mirror link. I will not make it public as I'm not sure about the licensing restrictions for distributing this dmg. Gahhhh wish I spotted this before I upgraded to Yosemite. I Have a deadline so I will install v6 java to get Pycharm up but I can't say I'm impressed. 6 is ancient. my renewal is up soon and given you guys are promising to resolve this I'll fork out for it. please sort it. How did we get into a situation where IntelliJ is 2 major JDK versions behind current? I could totally understand if we were stuck on 1.8, but there are very very good reasons not to have 1.6 installed and this is pretty disappointing. Please people, have a think about this. Apple dumped Java, some time ago. Oracle took over the production of Apple-compatible releases of the JDK. There are bugs _in_the_JDK_ when running on OS X. When I fire up NetBeans, my GPU immediately switches to the discrete, power-hungry unit. NetBeans is an Oracle product. They have yet to solve the power problem on Apple hardware. It's a stretch to expect IntelliJ, which makes an IDE, not a JDK, to sort this stuff out so that we can continue to use our Macs for development (as I do) when, starting with Steve Jobs, Apple declared war on Java, and by extension, on Java developers. IntelliJ is working to fix problems, some of which are properly the in the domain of Oracle. Good luck to them, and let's hope that Oracle sees value in more timely support for OS X users of the JDK. Pbw, of course you mean Jetbrains, not IntelliJ. IntelliJ is not a company, but a product of a company named Jetbrains. While what you say about the JDK might have some merit, Jetbrains sells products that depend on that JDK. They are responsible for their products, and promise that their products perform as designed and as promised. People who have purchased these products expect them to work. Jetbrains could create products that don't depend on Java. I'd say 99% of the apps on my machine don't depend on Java. It would take a tremendous effort for Jetbrains to convert these products to be native. Their customers can also purchase competing products that don't depend on java. There are some competing products out there. Personally, I'm sticking with PyCharm. It works fine for me, after a few tweaks. I do wish it weren't java based, but it is, and I'm too lazy to switch. PhpStorm doesn't work on OS X El Capitan and Apple will no longer let you install Java 6. So far i've been unable to get it to work. Will editing the idea.properties do the trick ? In exactly which folder do I need to put that file ? Will I also need to edit the info.plist ? I've now edited the idea.properties file to read 1.6+ and placed it in a ~Library/Preferences/PhpStorm but that doesn't work. Alfred Vink, we provide custom JDK 1.8 bundles for all our products, here is the one for the current PhpStorm version: http://download.jetbrains.com/webide/PhpStorm-8.0.3-custom-jdk-bundled.dmg . Didn't know that, that's great! Matt Kolenda, what's the checksum of the file and the link that you have used to download it? It would be better if you open a ticket with support. So I'm running 10.11, and this complaint still exists. Is there an update one day that will fix this? I understand that 1.6 is ideal for performance reasons, and that's fine - but why does IntelliJ try to force me to upgrade the version of Java then? Just get rid of the alert? Dan, there is Java 8 bundled build: http://download.jetbrains.com/idea/ideaIU-14.1.5-custom-jdk-bundled.dmg . 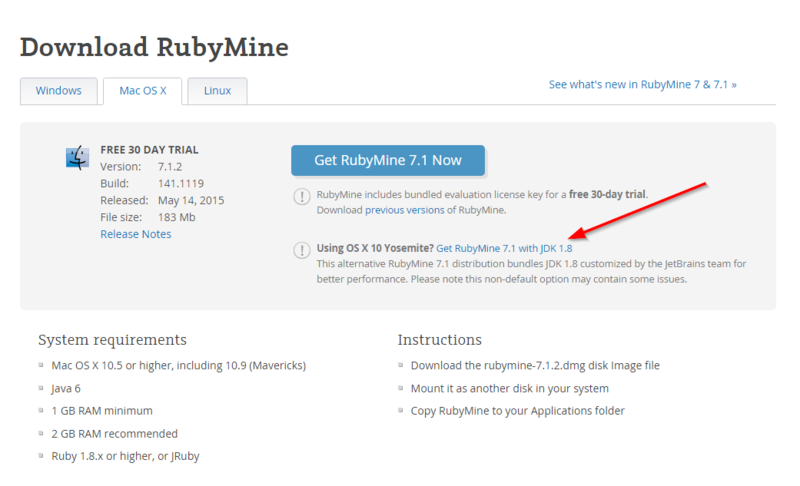 I just upgaded my Mac to El Capitan, and I am unable to use the Java 8 bundled version of RubyMine. Here is the error I see in the console when I attempt to start the app. Hope you guys will have a fix for this soon, because the Java 8 version is noticeably faster. I don't want Java 8... it breaks a lot of what I develop. FWIW, I changed the Info.plist to remove the 1.6*,1.7+ to just 1.7+, and that solved my problem - but as I understand it there are performance implications to this, is that right?